I’m not much of a conspiracy theorist, but I want to know what double-life my dentist leads that he and his scrub-clad henchwomen can’t fit me in for a cleaning in the next 205 days. 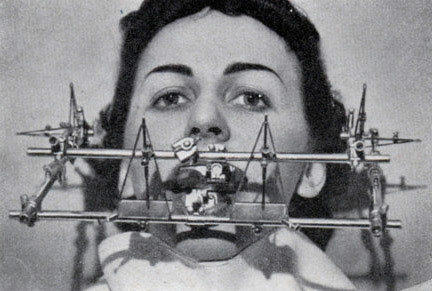 Are they hoping lack of dental care will result in a more interesting and meaty treatment option? They can’t be that busy. I’ve never encountered anyone in the waiting room, and no more than 1-2 in the anti-gravity chairs at any given time. I’m the patient that brushes and flosses. I don’t drink coffee or tea and have never touched a cigarette. Of all of the people’s mouths I know they have to look into, I’d think they’d want to bump me up a bit. I don’t bite and am not afraid of needles. I don’t have a sensitive gag reflex. I have a high tolerance for pain and don’t complain even when they put the Clydesdale-sized x-ray cardboard in. It must be a front for black ops. Think about it–an office no one would willingly wander into, all the “tools of persuasion” immediately at hand, shapeless scrubs concealing body armor and wire taps, and a reasonable shell for ordering and storing large amounts of toxic chemicals. I know what game you’re up to T.S., DDS, and it ain’t golf.